Just because a phone incorporates a terrific operating system that makes it simple to use doesn't make it a "toy" — as some die-hard techies contend — and doesn't mean it's not a serious, substantial, take-care-of-business device. Yes, I'm talking about Apple's iPhone as well as the new Palm Pre. The beauty of both these smartphones is you can use them easily, get the information you need quickly and navigate around the devices without wanting to fling them in frustration. These are phones that really are smart. And yes, they're incredibly useful because they're well-designed in terms of their hardware and software. That means you will wind up using them regularly, some of you feverishly, because they are such a pleasure. Palm has done an outstanding job with the Pre, released last Saturday, its first phone to use the company's new, stellar webOS operating system. It lets users flick, or "throw," as Palm puts it, programs off the screen with abandon while still running other programs, from e-mail to music. Apple's iPhone, aptly described as a "cultural icon" by Avi Greengart, consumer devices research director for Current Analysis, only continues to get better. A third generation of the phone, the 3GS, is due out June 19. "All phones are becoming smart, but some are Einsteins," wrote Forrester analyst Ian Fogg in a recent report about smartphones. Feel free to call the iPhone or the Pre "Albert." The Pre is 3.9 inches high, 2.3 inches wide, .67 of an inch thick. It weighs 4.76 ounces. The iPhone 3GS is 4.5 inches high, 2.4 inches wide, .48 of an inch thick. It weighs 4.8 ounces (The iPhone 3G is 4.7 ounces). The Pre is shorter than the iPhone but it's also more "grippable" and more likely to comfortably wind up in a pant pocket than the iPhone, which has an almost two-dimensional look and feel to it. Both phones are comfortable to hold in hand. You can use the Pre's slightly angled, slide-out keyboard to rest the phone between your ear and chin when you're on a call. It's definitely handier than trying to position the iPhone the same way and accidentally hitting the "end" or "mute" button on the screen. The screens on both devices are excellent, with a resolution of 480-by-320 pixels. The iPhone has a larger display of 3.5 inches, compared to the Pre's 3.1 inches, and the larger screen is a plus for Web browsing, e-mail, opening attachments and playing games. The Palm's keyboard is best used with fingernails rather than fingers. It's a real QWERTY keyboard, but it's tiny and not as good as those on most BlackBerrys. Palm has added some nice touches by having stand-alone keys for the "@" symbol and the period, frequently used characters in e-mail. It's a time-saver not to have to hit an "Alt" key and a capital letter to get those characters inserted. The iPhone's on-screen keyboard takes some getting used to, but is quite responsive, especially with its feature of enlarging letters as you select them so you can make sure you're hitting the right ones. The Pre and the iPhone use touchscreen displays that require only light touches and incorporate finger swipes, pinching and other and gestures to navigate the phones' programs. The Palm has more gestures to learn than the iPhone, and it takes a bit more practice to get used to it. The iPhone 3GS is billed by Apple as being about twice as fast as the iPhone 3G for activities like Web browsing and checking e-mail. Greengart, who has a test unit of the phone says it is "significantly faster and noticeably so" than either the 3G or the Pre. "There are some things on the Pre that are somewhat sluggish, but with the Pre, you're keeping multiple applications open and swiping between them," he said, which takes more memory, and hence, a bit more time. In addition to its multitasking abilities, Palm's webOS uses what the company calls "Synergy" to smartly bring together in one place all your information from different sources, such as Outlook, Google and Facebook, into one place to view contacts, calendar items and e-mail. "From the beginning, Palm stressed that the Pre would be a device that will be able to integrate information from a variety of sources," wrote William Stofega, IDC analyst in a recent report about the Pre. And this gives the Pre an edge over not only the iPhone, but all other phones. The iPhone 3.0 software, available June 17, will bring "push" notification to the phone for text message and other types of alerts. The Pre uses "intuitive notifications" that Palm considers less intrusive, with text messages, e-mails and calendar appointments appearing as notifications on the bottom of the phone's screen. The iPhone's single button on the front of the device is simplicity at its best, a "fail-safe" way to get back to the home screen at any time. That's not the case with Palm's s front button, which is used to zoom in and out of views of applications, which appear as cards on the screen. Palm has some serious catch-up work to do here. The Pre launched with a dozen or so third-party programs, or "apps," that can be downloaded from its App Catalog on the phone. The iPhone now has more than 50,000 applications in its App Store, which launched last July. Both the Pre and the new iPhone have 3-megapixel cameras. The Pre has an LED flash; the iPhone does not. The iPhone 3GS will have a video camera, the Pre does not. 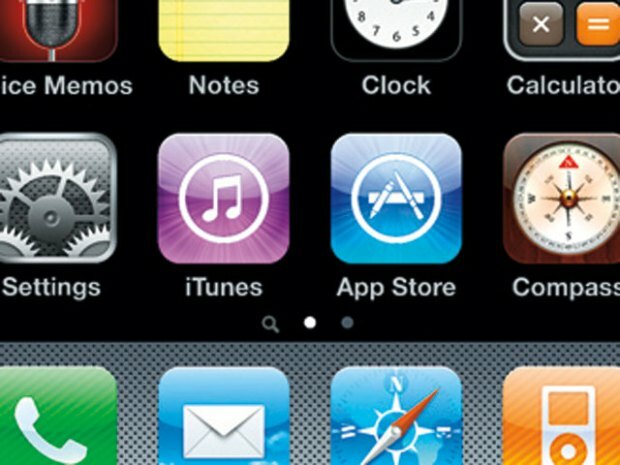 The iPhone 3GS will have a built-in compass; the Pre does not. While both phones have GPS chips and Google Maps, the Pre has voice-based, turn-by-turn directions through Sprint Navigation, which is included in the monthly price of the phone. GPS giant TomTom will be making a voice-based navigation program for the iPhone, but it will be available as an add-on program through Apple's App Store. TomTom has not said yet how much it will cost. The iPhone has a non-removable battery; the Pre's battery is removable. That's an especially good thing with the Pre, where buying a second battery is advisable. In my testing of the Pre so far, its battery life is my biggest concern. Even when I haven't uses programs that more quickly draw down the battery, such as Wi-Fi or Bluetooth, I haven't gone longer than four or five hours without needing to recharge. The iPhone seems to have a longer battery life by an hour or so, and the iPhone 3GS is supposed to provide a modest boost in that area as well. Palm doesn't address battery life as part of the Pre's specifications. Sprint, the exclusive carrier of the Pre, says only that the phone provides up to five hours of continuous talk time. 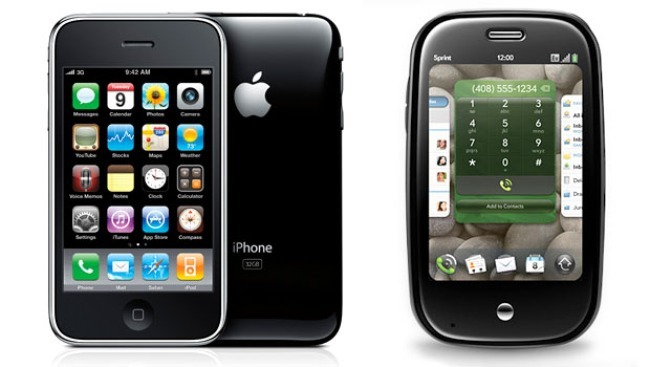 Apple says the iPhone 3GS's battery will provide up to five hours' in talk time or Internet use. The 8-gigabyte Pre costs $199 through Sprint, exclusive carrier of the Pre through at least the end of this year. Verizon Wireless and AT&T have indicated they may add the Pre next year. The 16 GB iPhone 3GS is $199, and the 32 GB version is $299. The 8 GB iPhone 3G is also available for $99. AT&T is the exclusive carrier of the iPhone in the United States at least through next year. Sprint's minimum monthly service plan of $69.99 a month for data and 450 minutes of talk wins hands-down over AT&T's for the same price. That's because Sprint includes unlimited text messaging and Sprint Navigation. Text messages are extra with AT&T at 20 cents a message, or there are plans that start at $5 a month for up to 200 messages. Carrier quality is in the eye of the beholder, or in this case, the phone holder. Both Sprint and AT&T have improved their networks. But depending on where you live, you might find one more frustrating than the other in terms of dropped calls and quality, or even lack, of 3G service.